One of my favorite parts of international travel is visiting the markets. I'm not talking about malls or large grocery stores. What I really like are street markets. The closer I get to the person making or growing an item, the more I like it. But there are so many different kinds of markets. In Japan, I loved going to the "Temple Sales", held at Buddhist temples on the weekends. The temple grounds fill with booths covered by plastic tarps protecting mounds and mounds of old kimonos, books, antiques and food booths. I bought up kimonos - from antiques to a few years old - to use the silk fabric for quilts. I bought way too many, but where was I to draw the line? There were so many and they were all so beautiful and so inexpensive. In Provence, my mother and I visited an antique market in Nimes, and I remember a wonderful booth in Nice with huge long tables covered with colorful French cloths and flat baskets piled high with every spice you could imagine. 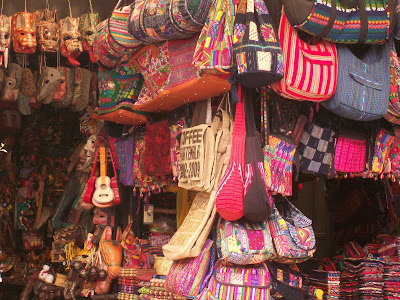 But I didn't understand the wonders of street markets until I'd spent some time in Latin America. Here, every little village has it's market day. It may have a community market where vendors can set up or there might be a street that is blocked off and covered with plastic tarps to protect the goods. I would much rather shop at the local street market than at the large grocery stores. If a town gets lots of tourists, there will be a artisan market area just for the handicrafts that tourists want to buy. But there is always another area where the locals can shop for their everyday needs. 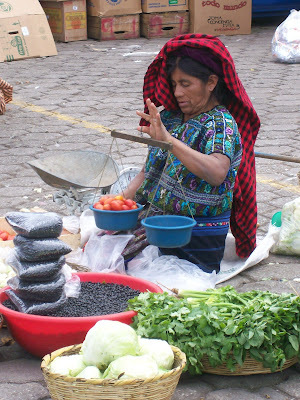 This woman in Antigua, Guatemala, carries her own set of scales and sells beans and produce from her garden. She probably travels to a different village each day to sell her wares. Next door, there is a permanent market set up with handicrafts for the tourists. It is divided into hundreds of tiny booths, many selling the exact same merchandise. Most of it is made in people's homes or in small factories in a little village somewhere. Once I bargain my way down to the real price, I am usually shocked at the small amount the artisan gets paid for the work. But paying the "dumb gringo asking price" does not mean any of the extra money will make it's way to the artisan. That is one reason why I prefer to deal directly with the artisan. In the village of Santa Catarina Palopo, near Panajachel, Guatemala, many of the women spend their days weaving cloth. They set up their work space right at the side of the road. They all dress in the traditional clothing of their village - turquoise wrap-around skirts and coordinated blouses called huipils. It is easy to tell which village a woman comes from by looking at her clothing. I have purchased many of their weavings. I often can't figure out what to do with them, but they are so much more special when I've met and talked to the weaver. And it's so hard to say no when I see how much work they do for so little money. 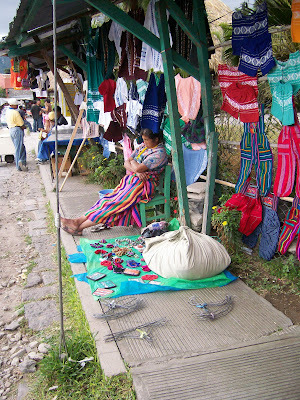 The main street in Panajachel is lined on both sides with vendors. Very few of them are selling their own work. The stuff they are selling is made somewhere else and they are hired to sell it. Unfortunately, many of them get very pushy. The worst will walk right up to a tourist and stand in front of them, blocking their path, to try to coerce them into buying something. When we visit there, we walk the same street every day (we have little choice if we want to get around.) The same vendors approach us day after day, no matter how many times we have said no. Although I love going to Panajachel and Lake Atitlan, I've come to hate the vendors there because of this. Thursdays and Sundays are market days in Guatemala's Chichicastenango. It is insane!!! But Thursdays and Sundays are also the only days to go to Chichi. Booths are packed in the area surrounding the church and the walkways between the booths are so packed with people that it can be hard to move. It can be a pickpocket's paradise, so shopper's beware! 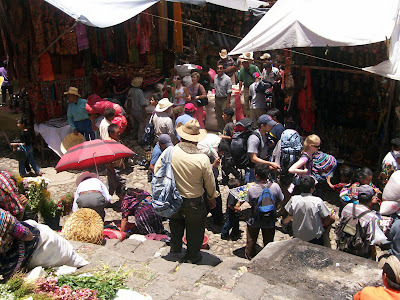 But it is worth going because vendors walk for miles with their goods to sell at the market in Chichi. The best deals can be found at the end of the day as you are sitting on your bus waiting to go back to wherever you came from. I'm usually tired and shopped out by then. I don't even care if I buy anything else, so it is easy to say no. The vendors know we are leaving and this is their last chance. All of a sudden the prices drop to almost nothing. They'd rather practically give it away than carry it back to their village. When we were in Panama, I was very disappointed that we weren't able to make it to the islands off the east coast where Kuna Indians live. I had been looking forward to buying Molas, the reverse appliqued cloths they make into blouses. I already owned a few, but I'd bought them far from Panama and had paid too much money for them. 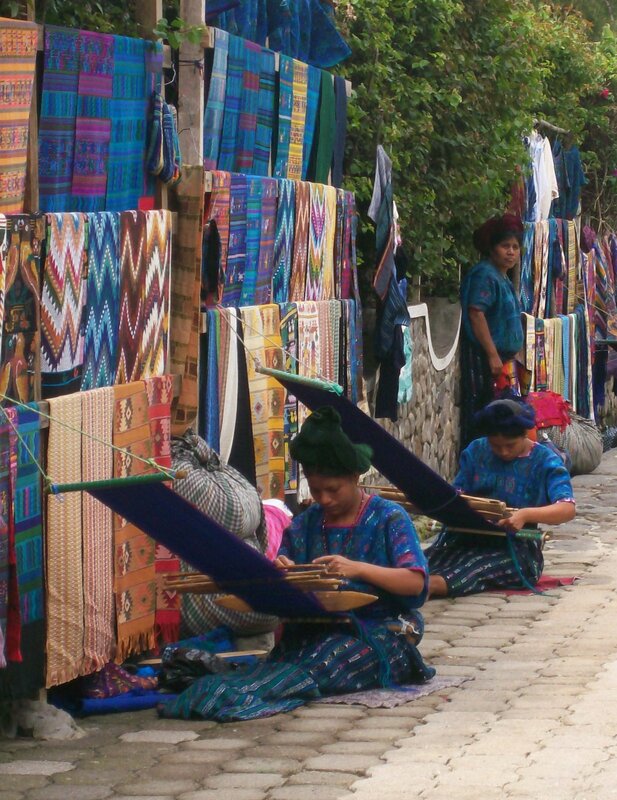 I was excited to find Kuna women selling the Molas from booths they'd set up in Panama city. The assortment was amazing and the prices were less than half what I'd paid in the past. This lady is holding the piece that I bought from her that day. Later I also bought some cloth that is used for their traditonal skirts that coordinates with the Mola piece. One of these days I will make a bag or something from the Mola and the fabric. In Cuenca, Ecuador, I fell in love with the flower market on the small plaza in front of the Church of El Carmen de la Asuncion. Every time we walked through that plaza, I wanted to buy all the flowers. But I had no place to put them. I watched the women picking off any fading petals and throwing them into a big box. I finally had to ask what they did with the petals. One of them told me that they put them in the bath water used to bathe the babies. That seemed almost like a fairy tale to me. I wanted to have had all those flowers to bathe my children when they were small. Now I wonder if they just say that to dumb gringa women who ask too many questions. Although I did see a few street-type markets in both Spain and Italy, most of them weren't very impressive. I guess it was because they sold everyday things rather that handicrafts. The exception would have to be in San Gimignano, Italy, because of the beautiful produce and flowers we saw there. I ran into a huge plaza full of a market selling postage stamps in Madrid. It was interesting, but did not inspire vast purchases. 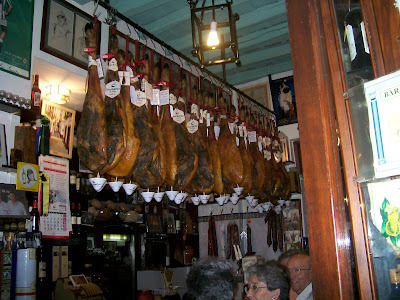 But what I really loved in Spain were the bars, restaurants, and stores selling Serrano ham. The hams were hanging everywhere - even over the bars - with little cups attached at the bottom to catch any juices that might drip out. 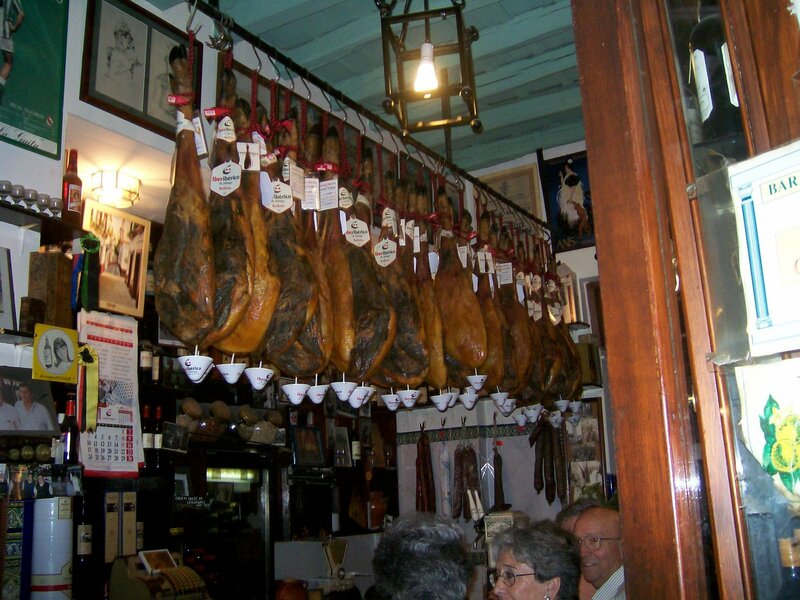 Both Spain and Italy had wonderful stores selling meats and cheeses and breads and wines. What more could a person ask for? If I lived there, I would probably do most of my shopping in that kind of store. Well, that plus a produce market. A great article and I agree with you totally. We love walking around the Saturday morning market in Burgundy in France when we are there, such a pleasure. We visited Marrakech earlier this year and walking around the souks was definitely an experience not to be missed! Thank you, Brian. Looks like my replies are not getting posted like I thought, so I'll do this again. You've made me really jealous. I would love to go to Marrakech. Both Turkey and Morocco are way up near the top of my bucket list. But I have loved the markets everywhere I have visited.